BUY THIS LIMITED 4X4 2.0L TURBO WITH HEATED LEATHER SEATS DUAL PANE SUNROOF UCONNECT 8,4 NAVIGATION REMOTE START BLUETOOTH AND MUCH MORE FOR THE SPECIAL INTERNET PRICE**--PRICE INCLUDES ALL DISCOUNTS AND REBATES AND IS GOOD THRU 04/01/19--RESIDENCY RESTRICTIONS APPLY--FOR RETAIL SALE ONLY NO DEALERS PLEASE **-INTERNET PRICE REQUIRES FINANCING THROUGH CHRYSLER CAPITAL AND IS NOT GOOD ON A CASH PURCHASE OR OUTSIDE FINANCING**Why buy from Classic Chrysler, Jeep, Dodge and Ram in Madison? 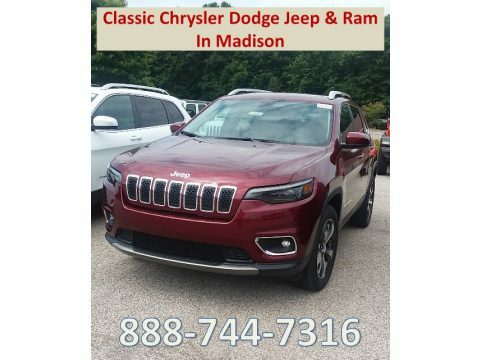 We offer a large selection of new cars, trucks, vans and SUV’s! From the true automotive icon, the Chrysler 300; the strongest muscle car in America, the Dodge Challenger; for the busy modern family, the Dodge Grand Caravan and Chrysler Pacifica; the rugged and confident Ram 1500, the luxurious and proud Jeep Grand Cherokee, the uniquely versatile Ram Promaster and everything in between.We are located East of Cleveland, we have a professional and knowledgeable Sales Staff, our Management Team is one of the best in Lake County and if you have had credit challenges in the past, give one of our Business Manager’s a call at 440-428-1141, they will be happy to assist you. We look forward to meeting you and earning your business!